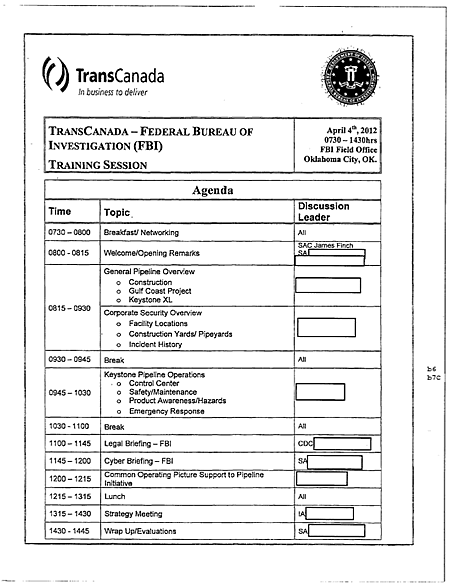 On April 4, 2012 the FBI held a daylong “strategy meeting” with TransCanada Corporation, the company building the controversial Keystone XL pipeline, according to documents obtained by Earth Island Journal through a Freedom of Information Act request. The meeting, which took place in the agency’s Oklahoma City Field Office, came just three weeks after President Barack Obama visited the state vowing to cut through bureaucratic red tape and approve the southern portion of the pipeline. In a speech at a TransCanada pipe yard in Cushing, Oklahoma on March 22 Obama said: “Today, we’re making this new pipeline from Cushing to the Gulf a priority. So the southern leg of it we're making a priority, and we're going to go ahead and get that done.” The same day the White House issued an executive order expediting the permit and review process for energy infrastructure projects.